Tonally reminiscent of Lian Hearn’s bestselling Tales of the Otori saga—Wang’s prequel of sorts to her Theonite series—is a standalone fantasy chronicling a small community’s struggle to survive a conflict that ravages their mountain home and threatens to destroy their traditional, albeit antiquated, way of life. Set on the planet Duna, on Mount Takayubi in the Kaigenese Empire, the story revolves around the populace of a remote, highly patriarchal village that, for generations, has raised and trained swordsmen with magical, almost supernatural abilities to fight enemies that invade the realm. The warriors, known collectively as the Sword of Kaigen, have repelled invaders for centuries. But it has been decades since the last conflict—and outside the boundaries of the remote mountain village, the world has radically advanced, both technologically and societally. Misaki Matsuda is married to Takeru, one of the heads of Takayubi’s leading warrior house. Although she has borne several sons, her life is unfulfilling, and the culture’s relentless sexist repression, coupled with the lack of any meaningful connection with her husband, has left her bitter. But when she discovers that an enemy attack is imminent—and that her own government has been lying to its people for years—she’s forced to embark on a brutal journey of self-discovery that will spur her to reevaluate everything in her life, from her societal role to her marriage. Although this is a character-driven tale, Wang complements the well-developed cast with immersive world-building, brisk pacing, and a fluid, richly described narrative. Also of note are the well-choreographed fight scenes, which—in lesser hands—can easily become mechanical and lose intensity. Wang’s fight scenes are fast-paced, clearly described, and exciting. The Sword of Kaigen is an utterly readable novel and the perfect starting point for Wang’s Theonite saga. 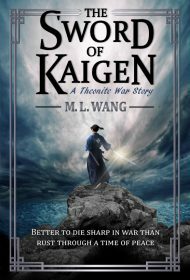 Fantasy and martial arts aficionados alike should enjoy this emotionally supercharged novel about love and loss, which pierces readers’ hearts with the precision of a samurai’s razor-sharp blade.